Arjuna Ridge Bed & Breakfast, in a beautiful setting with magnificent views, 30 minutes from Hobart. Located at Kettering, departure point for the Bruny Island ferry and at the gateway to the many attractions of southern Tasmania. With panoramic views over wooded hills, Storm Bay, the Derwent estuary and Bruny Island, Arjuna Ridge Retreat is a place of seclusion, peace and beauty. The India Room, Arjuna Ridge Retreat at Kettering. Inspired by the vibrant culture and colours of India this room appeals to those who enjoy romance and the exotic. Colourful silks and furnishings, original furniture and antiques sourced from India, a gorgeous teak four poster queen sized bed complete with sequinned bed hangings, combined with photographs by photographer Matthew Wade from his travels in India, create a stylish and fun environment.Queen sized bed, ensuite bathroom, sitting and dining area, airconditioning/heating, TV,DVD, stereo, electric blankets, tea and coffee making facilities, internet available. HOW TO FIND US: Take the Channel Highway south of Hobart and follow it until a few kms before Kettering. Turn left in to Manuka Road and after 3 kms turn right in to Warremar Way and follow it, keeping right all the way until you reach the end. We are the last building on the top right hand side. Welcome!! 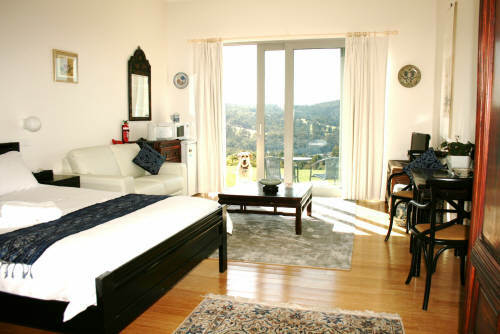 The Bruny Room, Arjuna Ridge Retreat at Kettering. Named after nearby Bruny Island discovered by French explorer Bruni D'Entrecastaux, the Bruny Room is an eclectic mix of modern, antiques and a touch of ethnic style. This room features a private outdoor courtyard with seating, a great place for a quiet breakfast. Queen sized bed, ensuite bathroom, sitting and dining area and access to solar heated swimming pool. Tea and coffee facilities, internet access, TV, DVD, stereo, electric blankets, air conditioning/heating, provided. TO FIND US: Please journey south from Hobart on the Channel Highway. Just before Kettering, at Oyster Cove, turn left in to Manuka Road. After 3kms turn right in to Warremar Way and keep right all the way. We are the last building on the top right hand sided. Welcome!! The China Room, Arjuna Ridge Retreat at Kettering. The China Room pays homage to rich and distinctive civilization of China. Beautiful antique Chinese furniture combined with original antique silk scroll paintings, oriental ornaments and porcelain create a room of elegance, style and comfort. Queen sized bed, ensuite bathroom, sitting and dining area, TV, DVD, stereo, electric blankets, air conditioning/heating, tea and coffee making facilties and access to solar heated swimming pool. HOW TO FIND US: Take the Channel Highway south from Hobart and just before Kettering turn left in to Manuka Road. Follow it around 3 kms and turn right in to Warremar Way keeping right all the way. We are the last building on the top right hand side of the road. 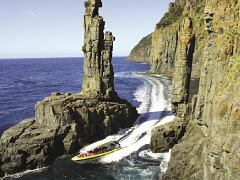 Two nights accommodation & breakfast, plus two tickets for the Bruny Island Cruise which we book for you, for two people. All for the total inclusive price of $550 The Bruny Island Cruise bus picks you up at their Kettering pick up point five minutes drive from Arjuna Ridge Retreat and returns you there in the afternoon. HOW TO FIND US: South of Hobart take the Channel Highway and just before Kettering, at Oyster Cove, turn left in to Manuka Road. Aprox 3kms along turn right up Warremar Way and keep right all the way up the hill. We are the last building on the top right hand side. Welcome! !